Workers prepare to remove the hoist from Atlantis that was used to separate it from the Shuttle Carrier Aircraft, or SCA, which returned it to Kennedy from California on June 3, 2009 after a ferry flight that ended its STS-125 mission to the Hubble Space Telescope. CAPE CANAVERAL - NASA nextweek will try to free a knob stuck between the dashboard and a cockpit windowon shuttle Atlantis - a problem that some fear could trigger lengthy launchdelays or even an early retirement for the orbiter. But NASA shuttle programofficials effectively are saying, "Not so fast." "I think it's tooearly to know whether it's a big deal or not," said Kyle Herring, aspokesman for NASA's Johnson Space Center in Houston. "This is just kind ofa new issue, and there's a lot of creativity, I'd say, that engineers have, andthey'll probably exhaust every option that they have to try to free it,"he said. "It's a little premature to say that an orbiter is finishedflying because of this." A notched rotary knob froma lighting bracket somehow got wedged between the orbiter's cockpit instrumentpanel and one of six forward windows during NASA's fifth and finalHubble Space Telescope mission in May. The knob is designed to mount a worklight to a bracket. Somehow, it floated into arecess in the corner of the cockpit, and two edges of one of itscrescent-shaped notches are pressing against the inside of the triple-panewindow, which is a little more than 2 1/2 inches thick. Small gouges already havebeen detected. Engineers are concerned that efforts to extract the knob mightexacerbate the damage. Flying "as-is" isnot an option. NASA cannot adequately evaluate the structural integrity of thewindow with the knob wedged against it. Another fear is that theeffort to free the knob might be so invasive that it could cause serious delaysin future Atlantis flights. The next one is scheduledfor Nov. 12. Any disassembly of thedashboard likely would involve the removal of cockpit instrumentation. Thatcould take months to complete. 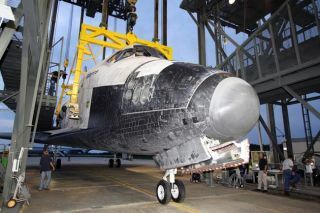 With shuttle fleetretirement set for the end of 2010, NASA could decide to sideline Atlantis andfly eight remaining missions on Discovery and Endeavour. Atlantis at one time hadbeen set to retire after the Hubble servicing mission, then serve as a donor ofspare parts. As it stands, Atlantis is scheduled to fly two more InternationalSpace Station assemblymissions. The second is set for May 2010. Technicianshave been unable to free the jammed knob. Dry ice was applied to itin an attempt to shrink the knob enough to retrieve it. That didn't work, soengineers are examining options that include drilling or cutting it out. "Your primary goal is not to damage the window," Herring said. On Monday, NASA willpressurize the crew cabin to just less than 18 pounds per square inch - higherthan normal pressure at sea level. The hope is that the space between thedashboard and the window will expand enough to free the knob. An assessment then would becarried out to see if the innermost pane of the window would have to bereplaced. Technicians at KennedySpace Center routinely swap the outermost panes of cockpit windows - panes thatget dinged by micrometeorite or space debris. But the innermost panes hadbeen changed at a California assembly facility that was shuttered years ago. Herring said theconsequences of such a swap on Atlantis at KSC is not clear. "There may be otherways to get around changing it out," he said. "But until they getthere, it's hard to tell how the schedule will play out. So whether that wouldbe an impact to a November flight is" to be determined.